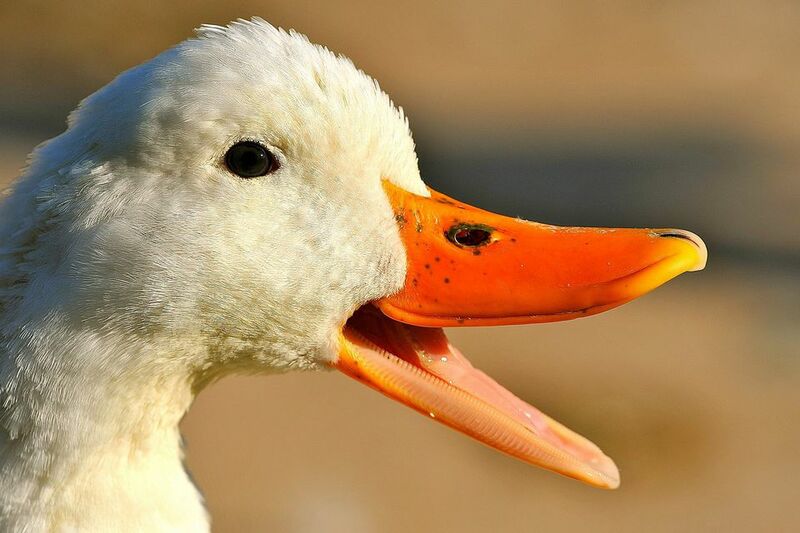 Ducks are omnivorous birds and constant foragers, always looking for their next bite, but do ducks have teeth to chew the different nuts, seeds, insects, grains, fruits, mollusks and other foods they eat? Understanding the different parts of a duck's bill and how each structure helps these birds eat is important, so birders know why ducks eat the way they do. Spatulate Shape: Ducks have an elongated, flattened bill shape. This spatulate shape helps the birds crush food similar to teeth, but without the same strength for pulverizing tough foods, and ducks don't repeatedly chew as they eat. The spoon-like spatulate shape also helps ducks filter food from water or mud. The overall size of a duck's bill and how much it is flattened varies between species and helps determine what foods ducks eat. The flatter the bill, the more plant material such as algae, seeds or aquatic grains in the duck's diet, while sharper bills, such as mergansers' bills, are specialized for eating more fish. Some other birds also have a spatulate tip to their bills, such as the spoon-billed sandpiper and the roseate spoonbill. Lamellae: The lamellae are thin, comb- or fringe-like structures on the sides of a duck's bill, just inside the edge of the bill, and can look like serrated teeth. These structures are slightly pliable and are used for filtering or straining food from mud or water. Most dabbling ducks have at least some lamellae, but the length, number, and spacing of the fringe are different for different species. The lamellae are not usually visible unless the duck's bill is open or there is some injury or deformity on the side of the bill that exposes the lamellae. In addition to ducks, geese, swans, and other waterfowl, flamingos also have prominent lamellae. Nail: Ducks have a small bump on the tip of the upper mandible of their bill, called a nail. The shape, size, and color of the nail can vary, and may be the same color as the rest of the bill or could contrast with the main bill color. The nail is useful for digging through mud or debris and helps ducks uncover small roots, seeds, worms, and other foods. Geese and swans also have nails on their bills. For some duck species, such as lesser scaups and greater scaups, the nail can be a useful identification clue as well. Grin Patch: The grin patch is a sneer- or smile-like curve on the side of a duck's bill that exposes the lamellae for easier filtration and feeding. The patch may be a different color than the bill, making it more visible, but the overall purpose of the grin patch is not thoroughly studied. Not all ducks have a grin patch, and it is more common on geese and swans than on most ducks. A grin patch is also seen on some penguin's bills. Despite the different bill structures ducks have that help them eat, these birds don't chew their food. Instead, small nibbling or chewing motions help ducks position morsels inside their bills so they can swallow each bite whole. Softer foods may be broken up by those motions, but ducks aren't chewing deliberately. Birders who want to feed ducks at a local pond can take into consideration the fact that ducks don't have teeth to make feeding the birds easier. Since ducks swallow their food whole, it is important that any food offered to the birds is small enough to swallow without causing choking or other difficulties. Choosing the appropriate foods to feed ducks, such as birdseed, cracked corn or small vegetables like peas or corn is essential, and these foods are also more nutritious. Ducks can also eat larger foods, such as grapes, more easily if they are cut into smaller pieces. Unhealthy foods such as bread, cookies, chips or popcorn should not be offered to ducks because these foods are "junk" to the birds, and are more difficult for toothless bills to eat. Birds don't eat as we do, and they don't have teeth in the same way that humans and many other animals have teeth. Learning about a duck's bill and how it feeds is a great way to understand why ducks behave the way they do and what foods they can eat most easily. What Do Wild Ducks Eat, Anyway? Can You Name the 12 Types of Ducks? What Do You Call a Baby Owl? What Beach Bird Do You See? Learn the Shorebirds!